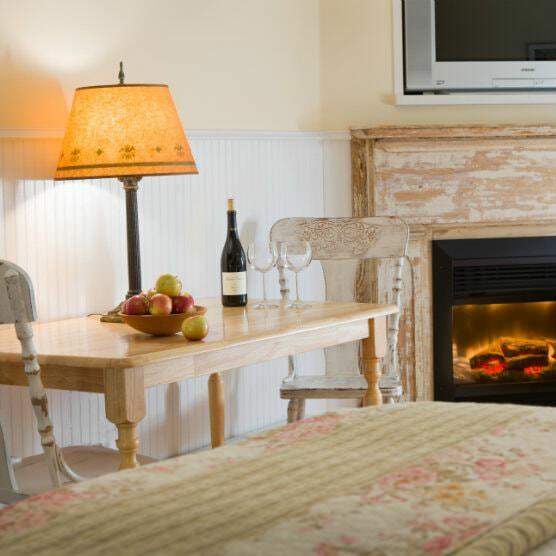 Welcome to The Woodstock Inn on the Millstream in the Hudson Valley, where nature meets comfort and creates a perfect getaway. Our comfortable, well-appointed rooms are rejuvenating for guests of all ages, while the property’s cascading Millstream and lush gardens create a natural sanctuary. Whether your vacation plans include adventure hiking, learning about the arts or simply enjoying quiet, natural beauty, we are excited to welcome you to our unique inn. Think bed and breakfast friendliness meets boutique hotel amenities. We are located just a short walk from the village center of Woodstock, NY – America’s most famous small town. With 19 individual rooms and suites, plus two cottages, we offer a variety of lodging options, perfect for everything from overnight business accommodations to couple getaways, friend get-togethers or weeklong family vacations. Our rooms are always fresh, clean, include superior beds and linens, luxury toiletries and free Wi-Fi. Karen, our innkeeper, is always available to personalize your booking experience and offer an insider’s perspective to the exciting and beautiful Hudson Valley. The area’s galleries, shopping, hiking, concerts and many local, authentic dining options define the Woodstock community and make us a top destination for visitors from all over the globe. In Woodstock, small-town charm is elevated by eclectic sophistication, making us a destination for true adventure seekers, culturally rich artists and over-extended city-dwellers who need a getaway. But be forewarned: even our most ambitious guests are often lulled into the magic of spending an afternoon relaxing by the stream, enjoying our exquisite gardens or swaying in a hammock under the shade of our towering trees. Let your stay reflect your style. All guests at our four-season getaway will enjoy our welcoming ambiance and peaceful paradise, where we offer privacy with a personal touch. 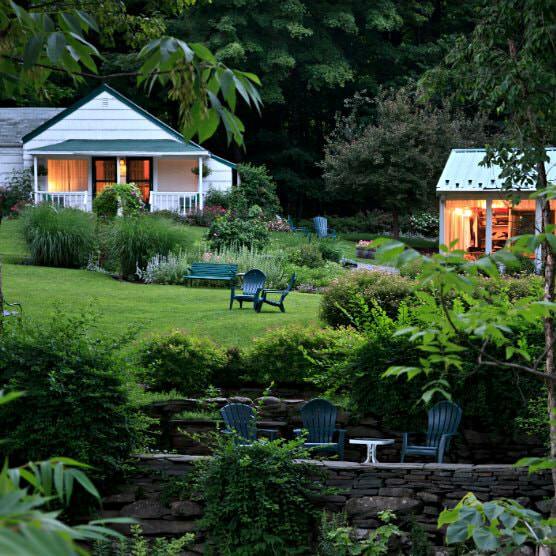 Come visit and experience the spirit of Woodstock New York, and enjoy the natural beauty of our little piece of paradise! From seeing room interiors to our lovely gardens and the stream through the seasons, our photo gallery offers a brief snapshot of some of the beauty you’ll encounter during your stay. Take a peek inside. Whether you’re seeking an invigorating hiking experience or intellectual lectures come see why America’s most famous small town has earned a “Must Visit” designation for all ages by National Geographic. We embrace quality throughout the Inn. From high-end Aveda toiletries to crisp linens and plush beach towels for swimming we strive to meet - and anticipate - each guest’s needs so you can focus on relaxing. We’ve survived another winter and even the snow piles lingering in the shade have little bursts of purple, yellow and pink as the crocuses emerge, amazing me with their resilience to bloom despite the elements. And here at the Inn we’re also ready to embrace this new spring. There’s definitely a buzz about town as people get ready to celebrate the Woodstock concert’s 50th anniversary. But our world-reknown charm was established well before 1969 and it continues to define us as a destination for creative thinkers, as a community which embraces seekers of all sorts and which is determined to keep its small-town feel and friendliness. These traits never go out of season and we’re so lucky to live in this special town that continues to embrace them. Come on up and see for yourself. Be awed. Be inspired. Be relaxed. Be ready to burst forth and enjoy an amazing, transformative getaway. Happy spring! Take the gang for a spring treat! 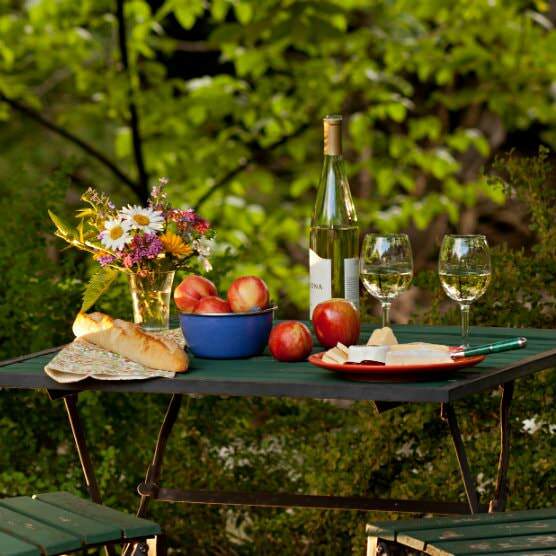 Grab your friends or deserving family folk and together enjoy springtime in Woodstock. In April any two night cottage stay includes the third night free. Enter code SPRING when booking or call/text us: 845-663-8152.